Colorado School of Mines is digging up space for a new $49 million dormitory project. The 120,000-square-foot building is part of a long-term plan to increase housing on campus, said Dan Fox, vice president of student life. It will hold about 400 student beds and work like a traditional residence hall with shared bathrooms and living spaces. Residence halls on campus have single, double or triple options. Board costs $4,773 for a single, $3,847 for a double and $3,248 for a triple per semester. 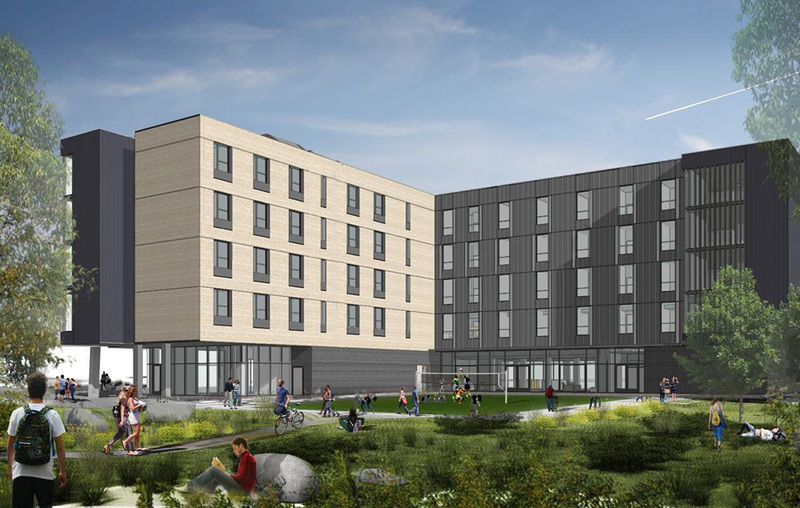 The building will be at 18th and Illinois streets, completing a quadrangle that has three other residence buildings and a dining hall. The last dorm built on campus was Elm Hall, which opened in the fall of 2014. Chris Cocallas, executive director of capital planning and design, said the university will bid for general contractors once the design phase is complete. The $49 million price tag is the total budget for the project, including construction costs and furnishing, he said. School of Mines has been working on the designs for about a year, Cocallas said. It is using Denver-based Anderson Mason Dale Architects and NAC Architecture out of Seattle as the designing architect. The space will house freshmen and sophomores when it first opens, Fox said. Fox said School of Mines has welcomed a slight increase in incoming freshman. It has 4,750 undergraduate students enrolled. Tuition for undergrads was $16,170 for Colorado residents for the 2017-2018 school year. Tuition for non-residents was $35,220. Construction on the building will begin this fall and is slated to finish in time for the start of the 2020 school year. The university has been trying to make the quad resident area more pedestrian-friendly, including a new walkway. “You’re taking a fairly large number of people and trying to give them some level of intimacy and some level of smaller community within a larger community,” Fox said. 2 Comments on "School of Mines plans $50M dorm project"
How about a parking garage? Mines continually neglects their ever-worsening parking situation. Furthermore, they’re removing yet another parking lot to put this building in. It’s getting to the point where only the first 200 students to arrive for the day get a parking spot on campus. Everybody else has to park a mile away. It’s hard to believe that CSM is such a prestigious school with how little common sense their administration seems to have. Hi Cassidy – Good points. You see, CSM is concerned for student health, and figures if everyone won’t or can’t walk, run, bicycle to school, then the least the school can do for them is restrict the parking, to force them to walk a couple miles coming and going each day. When you understand how pure their motives are, then it’s all OK, don’t you agree? BTW – I’m sure nobody cares what I think, but that is one ugly boring looking building.